The freight hauled by the Canadian for-hire trucking industry totalled 729.2 million tonnes in 2015, down 0.2% from 2014. The top five commodities shipped by weight were general freight; gravel and crushed stone; crude petroleum; wood products; and prepared foodstuffs and fats and oils. Together, these five commodities accounted for just under half (45.9%) of total weight transported by for-hire trucking companies in 2015. The weight hauled domestically within Canada decreased by 0.2% to 627.2 million tonnes, accounting for 86.0% of the total tonnage shipped. Trans-border shipments, the volume of freight transported from Canada to the United States and Mexico, fell by 0.3%. Local shipments, defined as distances less than 25 kilometres, declined by 4.2% in 2015, while long-distance shipments were up 1% and accounted for 77.8% of all shipments by weight hauled. 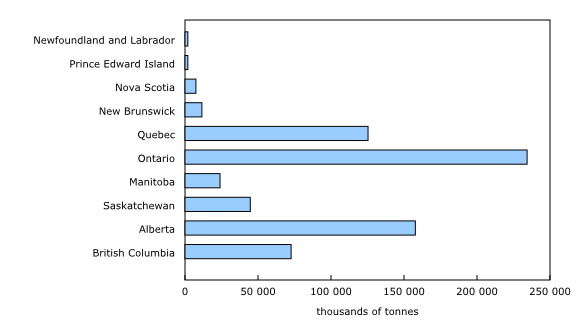 Ontario, Alberta and Quebec accounted for 71.0% of the total weight transported by truck. Ontario posted a 3.7% gain in 2015, mainly due to an increase in general freight and in gravel and crushed stone. 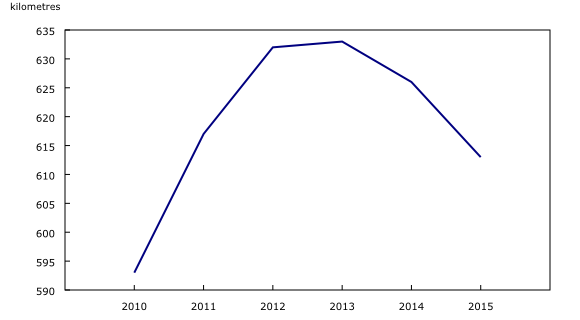 Conversely, Alberta posted a 2.5% decline due to lower shipments of crude petroleum. In 2015, for-hire trucking companies moved 64 million shipments an average distance of 613 kilometres. Many of these shipments, and the economic activity they support, are made possible by the reach of the Trans-Canada Highway. The network of interprovincial highways that form the Trans-Canada Highway connect all 10 provinces and facilitate the transfer of goods by truck across the country. This historic infrastructure project was authorized by the Trans-Canada Highway Act of 1949. Construction began in 1950 and continued until 1971, although the Trans-Canada Highway was officially opened in 1962. In the years since 1971, the Trans-Canada Highway has been improved and expanded. Today's Trans-Canada Highway consists of several different routes that cross Canada. The Trucking Commodity Origin and Destination Survey collects information on Canada's for-hire trucking industry (North American Industry Classification System, industry 484). The survey targets trucking companies with at least one establishment having an annual revenue of at least $1.3 million. It excludes foreign-based trucking establishments operating in Canada and non-trucking establishments with their own fleets (private trucking). Data for the reference year 2014 were revised. To request additional data tables, or to enquire about the concepts, methods or data quality of this release, contact Michel Savard (613-951-3175; statcan.transportationstats-statistiquesdutransport.statcan@canada.ca), Environment, Energy and Transportation Statistics Division.